Ryan Robbins scored the winning goal for Stamford AFC at AFC Mansfield. The Daniels host National League side Wrexham in the fourth qualifying round of the FA Cup on Saturday, October 15 with a place in the draw for the first round proper alongside Football League clubs like Posh on offer for the victors. Oliver Hill-Brown converted a last-minute penalty for Stamford AFC at AFC Mansfield. Photo: John Feetham. Stamford earned their plum tie with a last-gasp 2-1 third qualifying round win at AFC Mansfield last weekend. Oliver Brown-Hill converted a last-minute penalty to send Daniels through after Ryan Robbins had equalised a first-half Mansfield goal. That result and the subsequent draw made Stamford chairman Bob Feetham very happy, and not just because the club have now banked almost £17k in prize money. Feetham said: “This is going to be a big day for both football club and town. You always hope that a slice of cup magic is just around the corner and now, having got this far, we have been lucky to earn a home draw against one of the bigger non-league sides. “The response from local people has already been very good. There’s an air of both excitement and anticipation. A lot of people want to come and have a look and I hear that at least one local club will be asking the Peterborough & District Football League if they can postpone their scheduled game! Action from Desborough's win at Holbeach. Photo: Tim Wilson. “I want this match to be a really good advert for the quality football Stamford can play. Let’s hope a few of the new faces will come again. “Moving on, I am really delighted for the players who have battled their way through four successive away ties - this is our first one at home - and also safely negotiated a couple of replays. “It’s been an eventful sequence starting with a 3-0 win in gale force condititions at Sleaford. Then came the 4-1 win over Southern Premier St Neots - our best performance of the lot - followed by the 1-0 replay win against Gresley. We won it in the last minute after piling up nearly 30 shots. “Our win at AFC Mansfield was well deserved, but not one of our most impressive performances. They led and there were anxious moments - but here we are, ready for a memorable afternoon. “Wrexham will bring a few, no doubt about that, although they have a couple of league games ahead of the tie, the results of which, I am reliably informed, will influence how many make the near three hour trip. However, there is talk of at least 400 coming. Peterborough don’t have a home game - so that should help too. I say to you all: come and have a look at us! “I was asked yesterday if we could beat Wrexham. Why not? I seem to remember not that many years ago, and not far from here, Histon knocking Leeds United out of the FA Cup. That’s an incentive for us! There are no advance ticket sales, prices at the gate being £10 adult; £7 concessions and £3, 11-16. The club are also producing a special souvenir programme. Stamford are in FA Trophy action this Saturday (October 8) when hosting fellow Evo Stik Division One South side Basford United at the Zeeco Stadium. Spalding United, who top Division One South after putting together an unbeaten 10-game run at the start of the season, visit another side from the same division, Gresley, in the Trophy. Peterborough Sports will seek to maintain their three-point lead at the top of the United Counties Premier Division with a win at ON Chenecks. They will have to end a hoodoo though as they’ve lost on their last three visits to this venue. Sports will also be looking for a favour from city rivals Peterborough Northern Star who travel to in-form third-placed side Desborough. 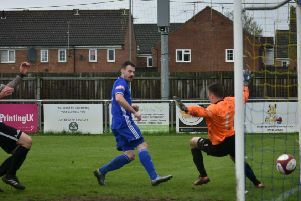 Desborough ended the unbeaten Premier Division record of Holbeach United last weekend when winning 2-1 at Carter’s Park. Stamford v Basford Utd . Daventry Town v Bourne Town. Leiston Res v Wisbech St Mary.